All our products carry the seal of excellence and our sales force is totally dedicated to provide excellent service to our customers in North-America, Europe and in Asia. All our coating products are manufactured subject to Iso9002 rules and performance criteria. We apply 8 coats of U.V. cured Aluminum Oxide finish for a total of 3.2 mils thickness. Abrasion result show 30% to 110% better than the competition using ASTM D 4060-95 technique. Adherence to the substrate is 100% compare to 95% for the competition's samples. All our pre-finished products don't show any "ribbing" of the varnish or "orange peel effect" of the sealer. By the addition of aluminium oxide to the polymer in the varnish, Wickham Hardwood Flooring offers more hardness & durability and a wear resistance higher than the concurrence. This is the new varnish OXYLUST+. Knowing that bacteria are a major cause of the odours and moisture problems, Wickham Hardwood Flooring protects all their products with the Ultra-Fresh* treatment. This is the best defence against bacteria and fungi built right into the product. A combination of Ultra-Fresh* with appropriate maintenance of your floor is a solution to a hygienic environment and the guarantee of longevity for your floor. OXYLUST+ offers superior protection against premature wood discoloration and yellowing. An antioxidant formula is added to the finish and makes a protective screen against the residual UVA wavelengths that can discolour your floor. 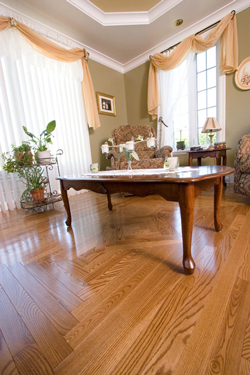 You will enjoy your floor with the appearance ‘recently installed’ for a very long time. Unequalled transparency and a remarkable quality of OXYLUST+ coating come from the precedent process and is a judicious choice for an optimal protection.